The 501CM body and the A12 back (matching numbers) went through a cla in April 2019and operate at factory specifications. Instructions manual for the 501CM. This is a stunningly beautiful 501CM. 501CM body: 10ER13618. Includes body, Planar 80mm f/2.8 T lens, Tessar 160mm f/4.8 T lens, 120 back, polaroid back, circular polarizer. Feel free to continue to monitor the item and it may fall into your price range. The Acute Matte focusing screen is clean and clear with no marks. The advance winds smoothly and the shutter release fires properly. The 80mm f2.8 Zeiss Planar T lens is clean and clear with no haze, fungus, or marks. Acute matte D screen & A12 film back IV are including. Planar New C 80mm f/2.8 T (w/Front cap), WL finder, Screen (Acute matte D), A12 film back IV. [AB Excellent ] Pre-owned, minimal signs of use. There is no separation. Near Mint (Pre-owned, almost no signs of use). Front lens cap, A12 Film back ,Strap,Box. Mint(Pre-owned, Like new). You'll be able to find a good item from this site. All shutter speeds are good. 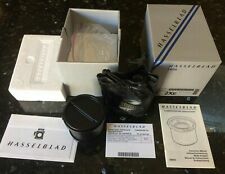 Hasselblad 2Xe Converter for 500C/M, 501CM, 503CX, 503CW, 202FA, 203FE, 205FCC - Almost New Condition. Hasselblad 2Xe Converter with Original Styrofoam Casing & Box. Hasselblad Leather Pouch. Hasselblad Inspection Certificate Card. In 96% mint condition and perfect working order with clean CB Planar 2.8/80mm T no.8809521 (cap), A12 magazine no.30EE14932, waist-level finder. Effects of cancellation. You may use a model cancellation form, but it is not obligatory. Hasselblad 501 CM with waist finder and A24 magazine. Black finish body and waist finder. Tres beau appareil photo Hasselblad 501CM, avec 80mm CFE T Carl Zeiss Planar multicouches, et Dos A12 modèle récent. (GMS) Gliding Mirror System. T he 501CM features a new improved tripod mount and shutter release button, and Gliding Mirror System (GMS) to prevent vignetting in focusing with lenses longer than 80mm. Tres beau appareil photo Hasselblad 501CM, avec 80mm CB T Carl Zeiss Planar multicouches, et Dos A12 modèle récent. (GMS) Gliding Mirror System. T he 501CM features a new improved tripod mount and shutter release button, and Gliding Mirror System (GMS) to prevent vignetting in focusing with lenses longer than 80mm. Hasselblad 501 cm + carl zeiss 80mm f 2.8 Come Nuova! (Hasselblad 501 cm Ottica Carl Zeiss 80mm f 2.8. o ottiche 35mm leica o voiglander con attacco m39.). The Hasselblad camera firm produced numerous cameras and camera equipment, including the Hasselblad 501cm. The Hasselblad is part of the V line of cameras. 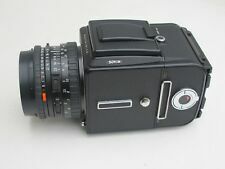 You can purchase this camera of the fifth series from eBay. What kind of camera is the 501cm? This camera model is a medium format camera, which means it takes images on media greater than 24 millimeters by 36 millimeters. It can also take full-frame images or large format images, but they are less than 4 inches by 5 inches. It's a meter-less camera with a lens-based leaf shutter, interchangeable focusing screens, and gliding mirror geometry to prevent vignetting when the photographer shoots with longer lenses. It has a pop-up magnifier that helps with critical focusing. The 501cm bears close resemblance to the company's 911GT3, but it's more lightweight. How do you take a photo with the 501cm? Support the body and lens with your left hand. Place your left index finger on the shutter release. Use your right hand to operate the winding crank and the lens rings. Be careful of your left thumb's placement because if it slips, it can depress the lens release. How do you load the camera film? Load the film: Load the film in the direction facing the rollers. Snake the film: Snake the film through the rollers and under the pressure plate tab. Close the back: Close the back opening key. Roll it. Roll it onto the opposite spool and wind it until the word 'start' shows on the roll. Some devices need a little more film wound on, so you may lose part of the first frame. Open it: Open the opening key. Load it: Load the back and close the key. Why would you shoot in medium format? The larger film surface lets light-sensitive halide crystals on the film stock distribute further apart. This results in a less grainy photo. The larger surface also allows for more halide crystals, which reproduces greater detail. Medium format photos are known for better photo quality and greater crispness and tonality than 35mm. It is easier to develop than large format, or sheet sized, film.